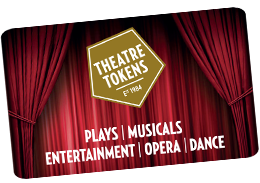 Theatre Tokens are the ideal gift that can be used at more than 240 venues nationwide including all of London's West End theatres. With no expiry date, they are the perfect gift for anyone…at any time. To use your card to pay for a theatre ticket, ring the theatre, quoting the 16 digit number and the 4 digit pin found underneath the scratch off panel, or visit the theatre in person where the theatre will scan the barcode. Currently Theatre Tokens cannot be redeemed online. You can use all or part of the balance on your Gift Card to pay, or part-pay for theatre tickets at participating venues. If the theatre tickets cost more than your Theatre Tokens balance you will need to pay the outstanding amount using cash or a debit/credit card. A full list of participating theatres can be found at https://www.theatretokens.com/find-a-theatre.